This guide will show you how to use our “Timetable” tool to keep your school day organized and efficient! 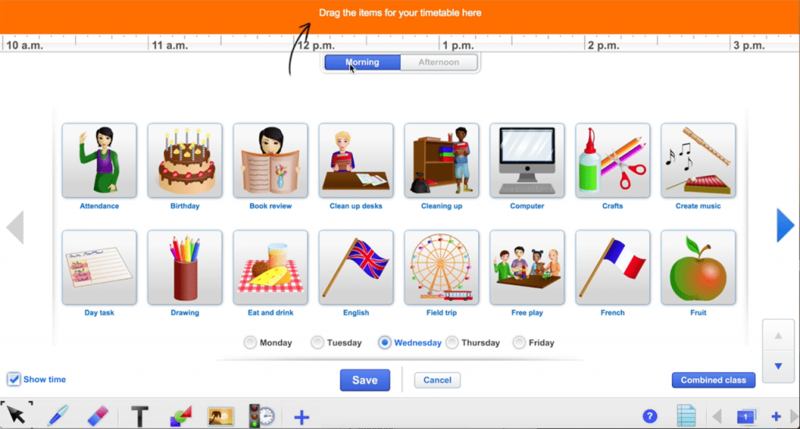 You’ll be able to plan time for all of your lessons and class activities with the help of your interactive board! You can find and access the “Timetable” through the “Widgets” option on the toolbar, which is the traffic light and clock icon found at the bottom left-hand side of the screen. Upon opening the tool for the first time, you will be brought to the “settings”/“editor” screen. Here you will see that you can choose from “morning” and “afternoon” and you can drag and drop daily routine cards onto the timeline above. Scroll through all of the options to see what you want to schedule for your class! Once placed onto the timeline, the daily routine cards can be shortened or lengthened to change the amount of time you want to spend on that particular subject or activity. Once you have set up the timeline as needed, press “save” and the tool will then minimize towards the top of the board-screen. The tool will stay available up at the top of the screen for use during any Gynzy lesson or tool you open from now on! You can now access the “Timetable” via the two small tabs at the top of the screen. Clicking the “+” label will open the timetable up at the top of the screen, the “-” will minimize the tool once again. Click or press the “gear” icon/tab to go back to the “settings”/“editor” screen to edit your timeline if need be.